Lean Simulations: Excel Yamazumi Chart - Some serious charting. Excel Yamazumi Chart - Some serious charting. 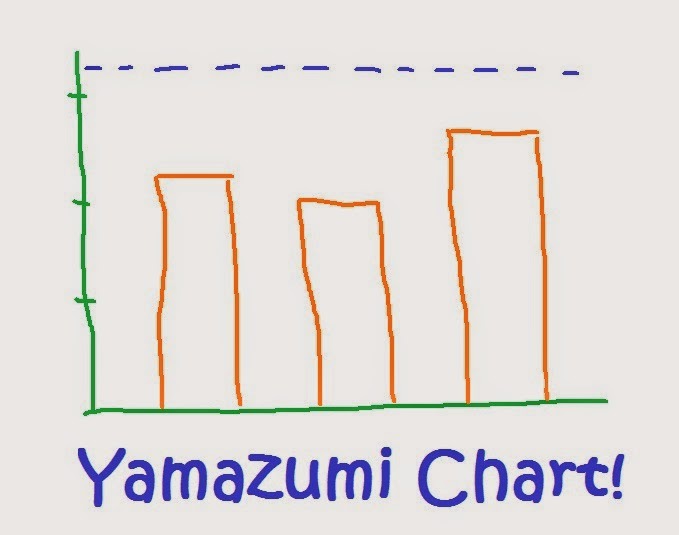 I've been thinking a lot about Yamazumi charts lately. After posting about a pretty cool online Yamazumi chart last week, I did some sleuthing. It's true that more and more of my time is spent "connected", so it's refreshing to see people creating web-based tools that we can use without downloading anything. But I find when it comes to the heavy lifting, I still revert back to good ol' Microsoft. Is it just me, or does a chart like this make everyone else giddy too? This Excel Yamazumi chart has all the bells and whistles! A Yamazumi chart lines up all the operations and charts them side-by-side. Each operation is clearly shown in comparison to the others. In the example above, we have seven operations. With a single glance, some balance issues are clear. The third operation (Buff Three Parts) is the quickest, at about 23 seconds, while the fifth operation (Attach Bracket) takes the longest. Operator three will have some idle time, while operator five will struggle to keep up. 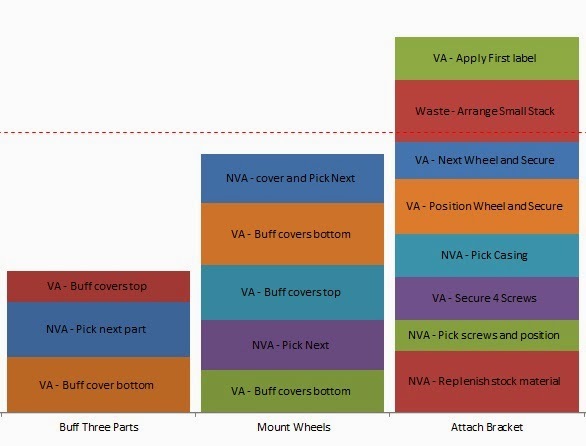 Without inventory limits , parts will build up quickly after 3 and 4. All this is simple to see within a quick 10 second analysis, showing the power of a simple Yamazumi chart. Second, the takt time is clearly displayed as a dotted line along the top. Once again, it is clear without any indepth analysis that there are some operations which are greater than the takt time, creating a potential for short shipments. Actually, upon closer inspection at the actual formulas in the Excel sheet, the dotted line turns out to be mean cycle time, not the takt time. Average cycle time is not quite as useful, but formulas are easy to adjust, and the sheet is not locked, so it's dead easy to change this. Above is a close-up of Operations 3-5. We can see details of the operation with the least work vs the one with the most work. These details are inside each bar! Each bar in the bar chart contains the entire sequence of steps that make up the process. Voila! This Yamazumi is a "stacked bar" chart. Why is a stacked bar chart helpful? 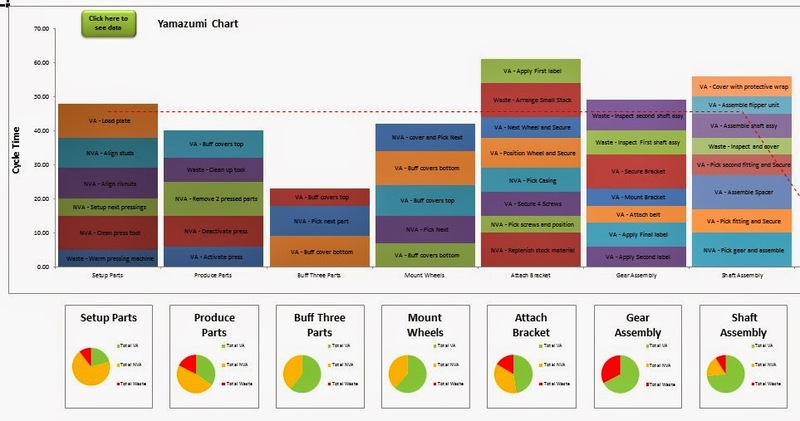 A Yamazumi chart is also called a work balance chart for a reason. When it's time to balance this inefficient process, we can easily see how long the individual steps for each process take. Looking at the chart, we can propose taking some steps from #5 and adding them to # 3, to give us a much more balanced process. Realistically, we would need to go to the gemba and verify. For example, is it possible to "Apply First Label" in a different operation, so that operator # 5 has less work? It all depends on what the label looks like, where on the part it has to be applied, if any other operation depends on it, or if something else needs to happen first. A Yamazumi chart will highlight potential, but a trip to the gemba will reveal truth. Finally, this particular Yamazumi chart has another interesting feature, usually found on Value Stream Maps. Each step has a label applied to it. Is the activity "Value-added", "Non-value added", or simply straight up "Waste?" These labels allow us to visualize more nifty things. Underneath each bar, there's a little pie chart that shows the percentage of value added versus non-value added activity. Our job as lean champions is to attack waste, and these small dials make it easy to see where to focus. A nice little kaizen to the Yamazumi chart! Are you interested in an Excel Yamazumi chart like this? You should be! I'm sad to say that I didn't make this Excel file, but the good news is that it's free and available for download at adaptivebms.com. Someone put a lot of work into this sheet, so why recreate it? Also, you can find a whole range of other Excel templates on the adaptivebms tools page, including a 5S audit sheet, a red tag template, ishikawa diagram and tons of statistical tools! 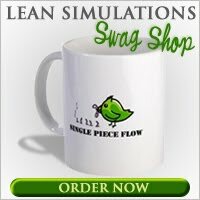 I've added this tool to my list of free lean tools and downloads. Yikes. It was working for me, but maybe I didn't dig deep enough. Let me know if you get any further, maybe I can touch base with the creator. Hello, I think there are some problems with the Excel calculation engine in some version of Excel. If required, press Ctrl-Alt-F9 to force a complete recalculation. This can affect any Excel file, not just this one. Hello. I'm having issues as well with the series data pulling through to the graph page.. I have tried anything.. does anyone have a solution? Honestly, I even tried individually adding in cells and data and still can't get it to show up on the graphs. My solution was to simply do a stacked bar chart manually and set it up to allow me to add as many cells as needed. I'm sorry you didn't get it to work right. You can try checking with the adaptivebms guys and see if they have a resolution. But since you basically created a stacked bar chart already, probably you're almost there already.